This print commemorates a performance at the Kado Theater in the fifth month of 1816. Gion Sairei Shinkōki was an extremely long play written originally for the puppet theater. It was first staged in 12/1757 in Osaka. There were four authors of whom we know little. 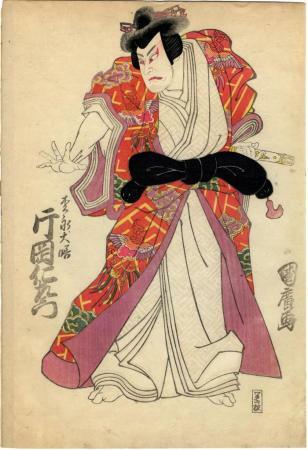 In 1758 the first kabuki production appeared in Kyoto. "The play is set in the second half of the sixteenth century, a time of civil war in Japan, when numerous provincial lords vied to seize control of the country." If, as we believe, this print dates from 1816 then that would be the first year that Kunihiro appeared in the marketplace as an artist.